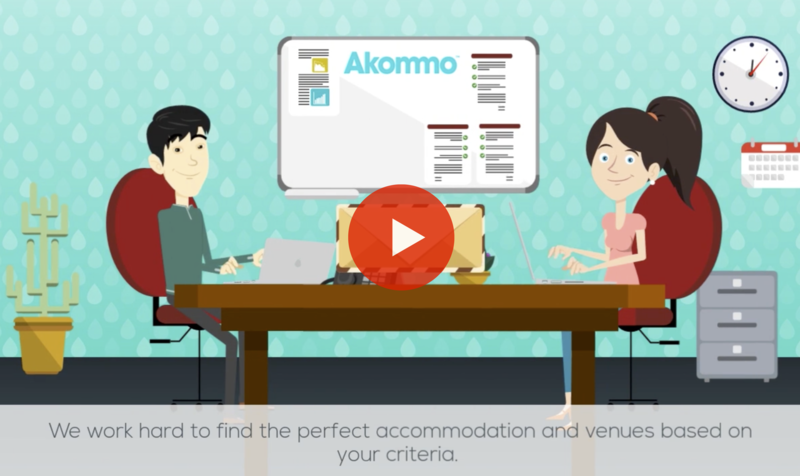 How Akommo can help you find your event accommodation and venues in Cannes, Barcelona and other major European cities. Create a free profile and search for your event. Browse all available event accommodation and use our handy filters to get the best results for your event delegates. Save all your favourite accommodations to your wishlist simply by clicking on the heart or the “Add to wishlist” button. You can then ask our helpful support team questions about each saved accommodation by online chat, email or phone. You can also share your full wishlist for an event or your accommodation choices with colleagues on Twitter, LinkedIn or by email. Once you’ve made up your mind, you can easily make an enquiry and check prices in order to complete your booking online. Everything will be saved to your Akommo account right here so you can check the details anytime, anywhere. You can manage everything from your account! All the important information about your accommodation is in one place - arrival and departure instructions, invoices, reservation history, and more - and you can download and share it with your delegates. You can also add extra services, such as additional cleaning, airport transfers, catering, grocery shopping delivery, and even personalised welcome packs. We love customer service! From your first search, throughout the event, and until your final check-out, you will have the dedicated Akommo team of accommodation specialists available to answer your questions and attend to your needs. We never want you to feel alone while managing your team, so Akommo provides 24/7 on-site support during events, followed by a post-event review. Call, email, chat, tweet us, or even come by the office for a coffee and some Barcelona sunshine! Don’t know where to have your next European corporate event? Start by having a look through our cities and see what inspires you! Read up on what each city has to offer, get insights and tips on our blog posts about corporate event venues, and check out photos of event venues we LOVE. After you feel inspired by the cities, choose one or even multiple cities to host your perfect upcoming corporate event! If you can’t find your city on our list, don’t panic! We’ll happily look into accommodating any request. Just simply fill out your details in the fields with any special requirements on the city page and send away! You will be assigned a free Account Manager who will prepare you a free, no-strings-attached proposal within 72 hours of the request. We’ll present you with the perfect venue ideas from our large repository for your upcoming event. We’ll then schedule a call to discuss your event needs - whether it’s for a large- or small-scale event, we’re committed to finding your perfect venue! Akommo will save you COUNTLESS hours of back-and-forth communication that comes with the event industry, from the venue finding until the post-event follow-up. We work as the intermediary between you and our extensive hotel, catering, venue space, and even transportation partners. Not to mention - we make sure to negotiate the conditions for the contracts, the best rates, and can help with translation, so all you have to do is read and sign! Every event can have its unique challenges. That’s why we’re available to minimise the stress, so you can focus on your event’s success. We provide complimentary 24/7 on-site service for events upon request. Additionally, we provide post-event follow-up to ensure that you were fully satisfied with our services.